The Tour is a non-competitive 12, 30, 50, 75 and 100 mile bike ride through the scenic Litchfield Hills for riders of all ability levels. For walkers and runners, the Tour also offers 2, 4 and 6 mile routes through downtown Torrington. This year's Tour will be held on Sunday, August 4th. The Tour's mission is to bring together community resources with the common goal of raising funds to support the care, treatment, education and prevention of cancer for residents living, working, or receiving treatment for cancer in Northwest Connecticut. By donating funds to The Cancer Care Fund of the Litchfield Hills, Inc., we will have a positive effect locally, in the Northwest corner, as our friends and families battle the disease. 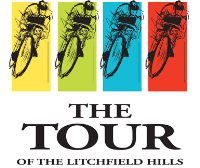 The 16th annual Tour of the Litchfield Hills will be held on Sunday, August 4th. The Tour benefits The Cancer Care Fund of the Litchfield Hills, Inc. There are rides of 12 miles, 30 miles, 55 miles, 75 miles and 100 miles. All of the rides are on the scenic, though hilly, roads of Litchfield County. There are also walking and running routes of 1.2 miles, 4 miles and 8 miles. All routes start and end at Coe Park, Rt. 202, Torrington, Ct. Numerous rest stops provide water and fruit. Sag wagons patrol all the routes. The registration fee is $45 if you register before July 20th; $50 if you register on or after July 18th. The registration fee includes a t-shirt and a free picnic at the end. All participants are urged to raise funds to benefits The Cancer Care Fund of the Litchfield Hills Inc.